Peter Thiel is starting to make his mark on Trump's transition team. Thiel, a billionaire investor and Facebook (FB) board member, joined the transition team days after the election and is gradually bringing on other members of his circle. While Thiel clashed with Silicon Valley during the campaign by endorsing Trump early, this group may be the strongest -- or only -- bridge between the tech industry and the president-elect. Mark Woolway, the acting CFO of troubled HR software startup Zenefits and Thiel's longtime business associate, is joining the President-elect's transition effort. "Mark will continue to serve as acting CFO at Zenefits while he helps out on the transition team," Jessica Hoffman, a spokeswoman for Zenefits, confirmed in a statement provided to CNNMoney. Woolway was an early VP at PayPal (PYPL), which was cofounded by Thiel. He later served as a managing director at Thiel's hedge fund, Clarium Capital. Kevin Harrington, who has worked as a managing director at two of Thiel's investment firms, is also said to be working with the transition team for the Department of Commerce, according to Forbes. Separately, Bloomberg reports Jim O'Neill, another Thiel colleague, is being considered to take over the Food and Drug Administration. Trump's team did not respond to a request for comment. The latest batch of rumored and confirmed appointments highlight Thiel's influence in Trump's sphere. Since joining the transition team, Thiel has been spotted at Trump Tower in New York on about half a dozen occasions, according to press pool reports. Thiel is said to be playing a role in organizing a meeting between Trump and top tech executives next week. Last month, Trump's transition team announced that it was adding Trae Stephens to a "landing team" tasked with managing the transition at the Department of Defense. Stephens currently works as a principal at Thiel's Founders Fund. David Sacks, a friend of Thiel's who recently stepped down as CEO of Zenefits, has also been rumored to be taking a position on the transition team. Sacks has denied it publicly. Thiel, a PayPal cofounder and Facebook (FB) board member, shocked many in the tech industry by speaking at the Republican National Convention and pledging to donate $1.25 million to elect Trump in the final weeks of the campaign. "Most Americans don't live by the [Washington] Beltway or San Francisco Bay. 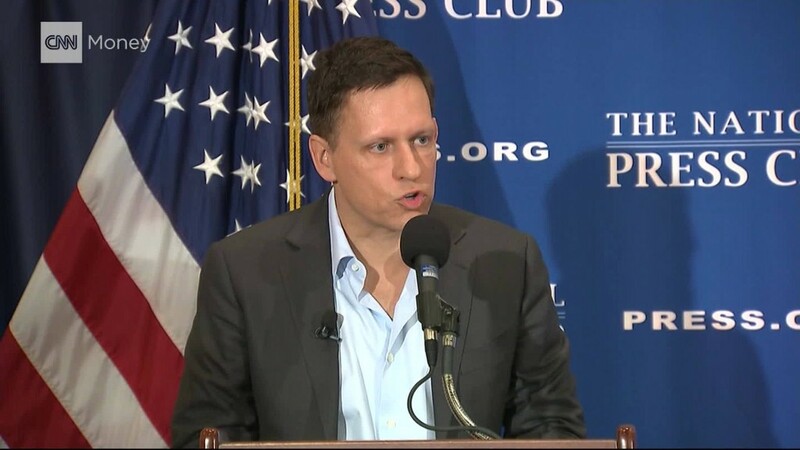 Most have not been a part of that prosperity," Thiel said at an event in October defending his endorsement. "What Trump represents isn't crazy and it's not going away." Thiel is famous in Silicon Valley for holding extreme, counterintuitive views. He is a rabid libertarian who has invested money to make people immortal, develop floating cities away from the reach of governments, and convince young people not to go to college, among other endeavors.